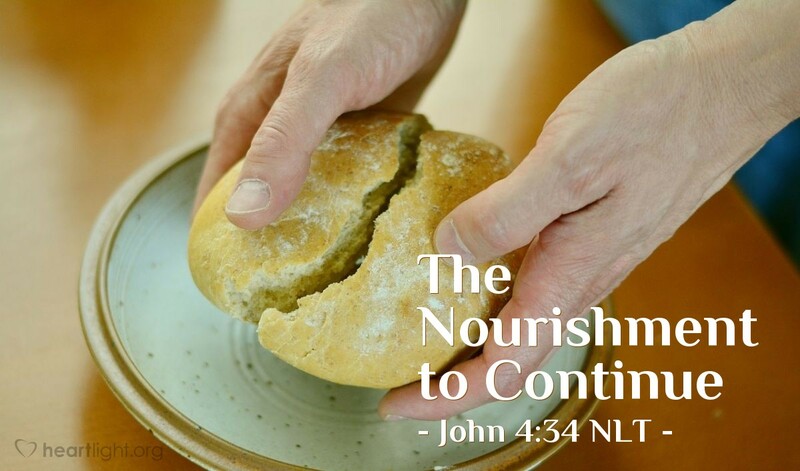 Then Jesus explained: "My nourishment comes from doing the will of God, who sent me, and from finishing his work." Where do you find the strength to continue your service to the Father? Clearly, some things in which we invest our time prove futile. Still, others are worse than futile; they are depleting as well as useless. However, consciously doing what we do to honor the Father, to follow his will, enables us to experience his empowering presence (John 14:19-23). Rather than leaving us depleted, we find new strength and vitality. Accomplishing the will of God and doing the work he created us to do (cf. Ephesians 2:10) blesses us as we bless others. That's why Jesus would reprimand the evil one with the truth that God's word nourishes more than bread (Matthew 4:1-4). So we need to ask ourselves today, "What do I need to obey? What will help me live in God's will for my life today?" Then as we do that, we too can rejoice in the nourishing presence and power of heaven. Majestic and awesome God, mighty in power and gracious in mercy, please give me the eyes to see what I most need to do today and each day to live in your will and do the work you have prepared for me. In Jesus' name, I pray. Amen.